Artwork hanging above the card catalog in the Arboretum Library. Artists are: (L to R) Diane Nelson Daly, Deborah Shaw, and Estelle DeRidder. Photo by Janice Sharp, © 2017. 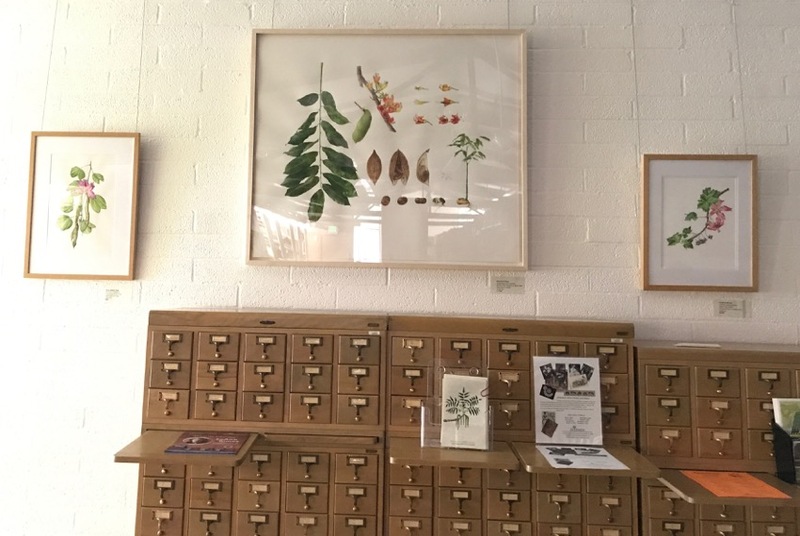 Illustrating the Urban Forest: 20 Years of Botanical Art, is now open at the Los Angeles County Arboretum & Botanic Garden. The exhibition, featuring Southern Californian urban trees, is now hanging in the Arboretum’s library and includes 29 artworks by 17 BAGSC artists. The exhibition is being held in conjunction with BAGSC’s 20th anniversary celebration. Photo by Janice Sharp, © 2017. BAGSC artists in the exhibition include: Diane Nelson Daly, Estelle DeRidder, Cynthia Jackson, Susan Jackson, Clara Josephs, Suzanne Kuuskmae, Patricia A. Mark, Arillyn Moran-Lawrence, Terri Munroe, Marilyn Anne Parino, Veronica Raymond, Olga Ryabtsova, Mitsuko Schultz, Gilly Shaeffer, Janice Sharp, Deborah Shaw, and Jude Wiesenfeld. Illustrating the Urban Forest: 20 Years of Botanical Art will run from July 6, 2017 to September 28, 2017. A collage of artwork in the exhibition in The Arboretum Library. Photo collage by Janice Sharp, © 2017. 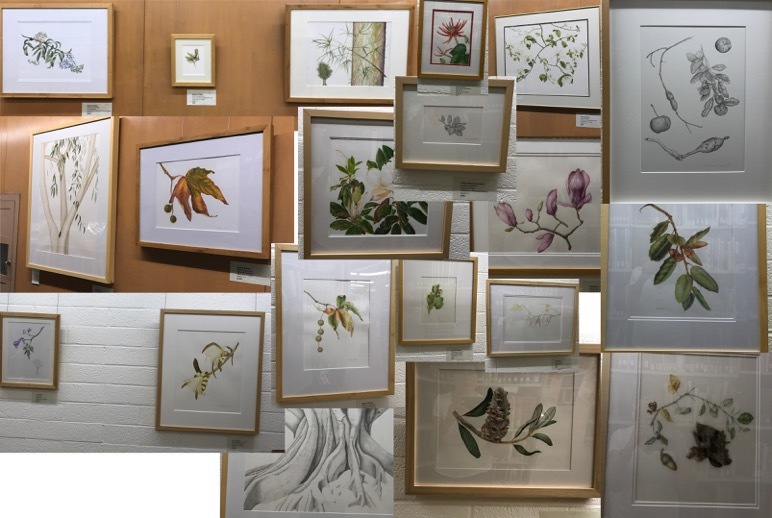 “Illustrating the Urban Forest: 20 Years of Botanical Art” Exhibition by BAGSC Members • Tour of the exhibition includes light refreshments and comments by the artists and Matt Ritter, our guest speaker. BAGSC members and their guests are invited to the programs and the dinner for $60 per person. Admission to The Arboretum is free; please see the Visitor’s Center attendant for free admission to the Arboretum Gardens for BAGSC guests. Please email Gilly Shaeffer to RSVP with your name, phone number and the number in your party. Gilly will send an email reply to let you know where to send your check, payable to BAGSC, by August 15. Los Angeles County Arboretum members and others who would like to attend only the exhibition tour and Matt Ritter presentation (but not the dinner) are welcome to join us for that part of the program. Arboretum members are $10; non-members are $15, payable at the door. There is no additional charge for Arboretum admission. 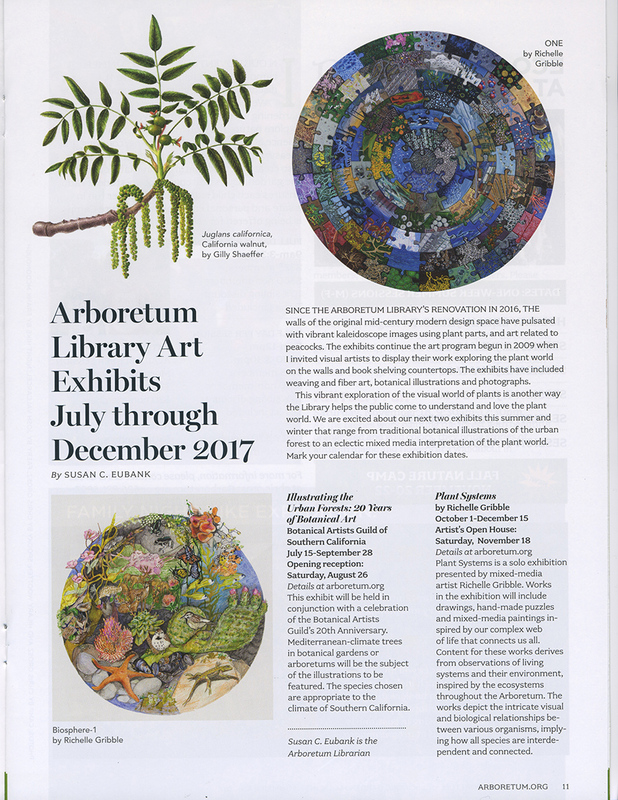 The 2017 Summer/Fall issue of The Arboretum’s magazine has a page featuring the upcoming exhibitions in The Arboretum’s library. The Urban Forest exhibition can be seen with admission to The Arboretum during regular business hours in The Arboretum’s Library. There are no additional charges. The Arboretum is located at: 301 North Baldwin Avenue, Arcadia CA 91007-2697.